Brookhaven Dentist Near Me: How Much do Veneers Cost? So how much do veneers really cost? The cost for porcelain veneers varies widely. They can run anywhere from $825 to $1,500 per tooth. There are several reasons for the difference in cost and yes, veneers can be quite expensive but they do offer several benefits. One of the most important benefits is a distinctly improved smile, which lead to an improved life. Getting dental veneers is a multi-step process. The initial visit usually consists of a consultation and depending on the dentist and the amount of work to be done, x-rays and/or impressions of the teeth may be done at this time. On the first working visit the dentist will remove approximately 1/2 millimeter of enamel from the tooth or teeth to be veneered and make a model sent to the lab that will make the veneer. 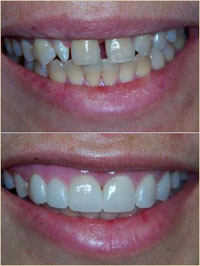 Normally it takes one to two weeks to construct the veneers. During the next visit, the veneer is temporarily placed to check for proper color and fit. You want a dazzling smile without gaps, chips, or stains? See a Prosthodontist. Usually, after just two visits, you can look forward to enjoying a brand new, natural-looking smile for years to come. How’s this possible? With porcelain veneers designed just for you. Veneers are made of durable porcelain and placed over the front of your teeth, enhancing their appearance and, in the process, boosting your self-confidence. How do you think all those movie stars got those great smiles? With a cosmetic prosthodontist and veneers. Your first appointment ends with prepping your teeth for the temporary veneers you’ll wear in the meantime. Your next appointment is all about fitting you with your permanent veneers. Once they’re in place, you can leave our office with a more natural, more esthetically pleasing smile than you’ve ever had. There are occasions when circumstances dictate additional visits. As an example, you may need to whiten your surrounding teeth to match the shade you desire. Dentist Dunwoody: What Discolors Teeth? 1. Drinks: Coffee and tea tend to stain teeth, especially when sipped over a prolonged period of time. Periodic professional cleanings and in-office tooth whitening will reverse these effects. 2. Smoking/Tobacco: Smoking and chewing tobacco have a negative effect on tooth color, gingival health, and breath. The best treatment is to quit smoking. Again, periodic in-office cleanings and professional tooth whitening can minimize the discoloring effects of smoking. 3. Dental Restorations: Metal restorations tend to breakdown at the edges (margins) and may reduce the transparency of tooth enamel. For a nice aesthetic appearance, replacing metal fillings with tooth colored composites or porcelains reverses these effects. Even tooth-colored restorations are subject to stains with time and may need replacement. 4. Age: As we get older there is a cumulative effect of tooth staining. The outer tooth enamel wears down with time, causing teeth to turn yellow. Porcelain veneers or dental bonding can replace the worn layer and restore that once lost youthful smile. In some cases, tooth whitening may be an appropriate solution. 5. Chemicals and Medications: During the tooth development of a child, certain antibiotics such as tetracycline or excessive ingestion of fluoride can cause permanent tooth staining. Though these stains cannot be cleaned or whitened, porcelain veneers or composite bonding can give the stained teeth a new look. In addition to the causes listed above, trauma and genetics play a role in changing tooth color. Keep your teeth whiter and brighter by regular dental cleanings (which usually include stain removal and polishing) and ask us about our cosmetic options to get that right smile. Dentist Sandy Springs: What Discolors Teeth? Drinks: Coffee and tea tend to stain teeth, especially when sipped over a prolonged period. Periodic professional cleanings and in-office tooth whitening reverse these effects. Smoking/Tobacco: Smoking and chewing tobacco have a negative effect on tooth color, gingival health, and breath. The best treatment is to quit smoking. Periodic in-office cleanings and profession tooth whitening minimize the discoloring effects of smoking. Age: With aging comes the cumulative effect of tooth staining. The outer tooth enamel wears down with time, causing teeth to turn more yellow. Porcelain veneers or dental bonding replace that worn layer and restore the youthful glow of teeth.